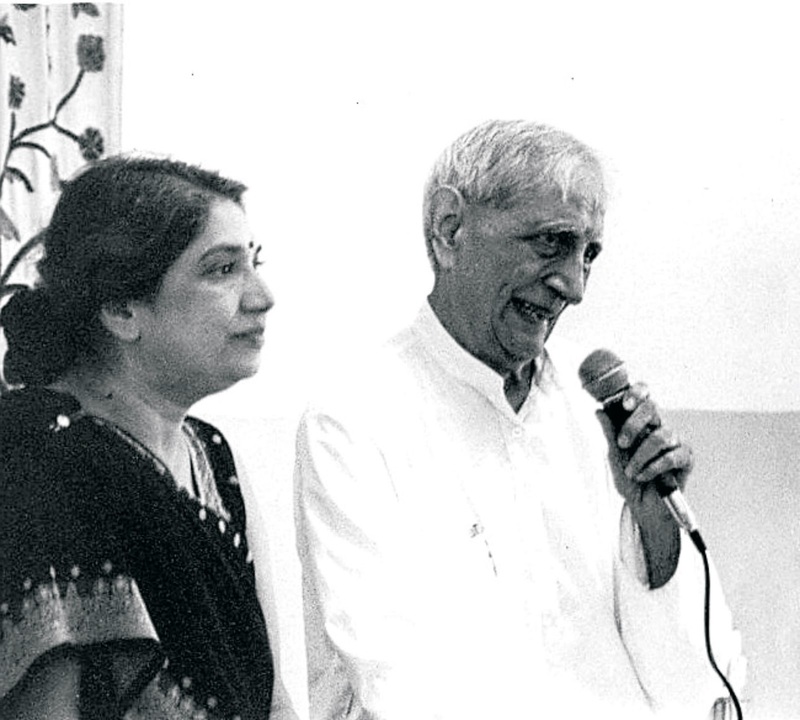 The topic for the Satsang on Sunday, 15th September, 2012 was Swadhyaya (Self Study). "Following someone’s style of life does not interest us. You have to be original and do what you want. Already we have these strong reactions which come, we dislike and we show our dislike. But in the end, we become a very tested personality and people can point to us and say that here is a person who is irritable, etc. Instead, cultivate contrary kind of qualities, one of pleasure, joy…Just in the beginning we can consciously try to start with one in the place of showing off or anger, etc. Yoga is basically of that kind – a peaceful appearance, experience of joy and larger understanding. These also can be consciously cultivated. There are people who are forming particular organizations where the whole group maintains the particular outcome and they are able to face society. They should take up yoga and try if this approach can be integrated…one of a balanced mind, not reacting too much, watching, showing a certain appreciation of whatever goes on and carrying on their duties. I think this is a point which is worth considering, that we should follow exhibitional kind of ideas or should we cultivate a more balanced state of mind? We have to decide." "Vrittis is a Yogic technical term which means that the Citta (mind/ personality complex) is continuously busy, it keeps thinking. Now we have to change this thinking nature of the Citta because we live life based on this. If someone shouts at us or hurts us, we feel bad. If things don’t go our way, we don’t like it and if they do, we get excited. This goes on. So yoga says – “Citta Vritti Nirodha.’ Stop the Vrittis. And this is the main definition of yoga and then it is analysed – what kinds of Vrittis are there? There are 5 types of Vrittis. 1. Pramana / Logical – the scientific way of looking at life. this should be there in every person. Don’t go on what someone says. Work to find out the truth. Perception and reality can be different. We should know that our sensory organs are limited. For example, there was a young man at the beach who heard a lady scream in a bungalow nearby. He went to check if everything was alright and found she had committed suicide by cutting her stomach. The maid walked in just then and thought he had committed the murder. I was studying law at the time and remember that the case went on for a very long time. The man kept saying he was innocent and had no reason to kill the lady, while the maid, the eye witness, insisted that she saw him commit the murder. This is what perception does to us. We see something and the opinion is formed without knowing the whole truth. 2. Viparyaya / Wrong Knowledge – It is illogical thinking. There is nothing there and yet we make something out of it. This happens very often. When I was small, I used to do Asanas on a mat and keep it in the hall. One day someone shifted the mat to my bedroom and in the night I woke up and thought someone was standing there. But later we found it was just the mat. So wrong knowledge affects us, especially things like superstitions. 3. Vikalpa / Imagination – We imagine, although we don’t know the future. As you saw in the skit today, it is raining and one person thinks there will be floods and gets anxious while the other thinks, why worry, what will happen will happen. If you want to think, think positive, otherwise, don’t think. 4. Nidra / Sleep – Even in sleep we dream and imagine things. Many times we dream things that seem like or may even be premonitions. But we should know that the incident is going to happen and we cannot do anything about it. Sixth sense works when the normal senses are in control. True peaceful sleep, like the state of Samadhi is very rare. Our thoughts in sleep are dependant on how we live through our life the previous day. 5. Smriti / Memory – Our past experiences and memories control our reaction in the present. Again, like we saw in the skit, the person was worrying about the floods because of past memories. So stop even the memory. Use it only if something good can be done from it, like reducing the ego. So yoga has gone into details of how and why the human mind thinks and how it should be functioning. Our mind is our servant, it should be in your control. It is the mind which creates the hell out of heaven and the heaven out of hell. It is the cause of all our limitations and it is also the cause of our Moksha. The mind can take us to the highest state. Stop worry, anxiety and thinking of the past and future. It is a matter of decision and reminding ourselves. Get involved in your work and the mind will be controlled."